Ramadan Mubarak. To make this beautiful simple dessert please keep in mind 3 key points- batter consistency, temperature of oil and temperature of syrup. If you make sure these key points, you will get perfect Boondia / Boondi / বুন্দিয়া. Using colour is totally up to your choice, though I keep it traditional using bit of red colour. Some of us love to add baking powder, I dont find any need for that. Enjoy. Also needs perforated ladle or flat skimmer. Boil cardamom, water and sugar in a sauce pan on medium heat till sugar dissolves. Simmer for 2-3minutes and turn off the heat and keep it aside. We need lukewarm syrup For Boondia / Boondi. Sift gram flour(Besan)first and add water slowly to make smooth the batter. First add ¾ cup water then little at a time. For me I did nt used all the water, though water amount will vary flour to flour. Add the oil mix it well. Heat the oil in a frying pan over medium high heat and oil need to be 1″ deep in the pan. Temperature of oil is the most important part, if oil is not hot enough you will not get round shape Boondia / Boondi. So make sure to test the oil, drop a batter in the oil, batter should rise immediately without changing colour. Hold the perforated ladle about 2 inches above the oil and pour some of the batter onto the perforated ladle. Batter will start dropping through the holes into the oil. If the batter doesn’t make round Boondia / Boondi right away through the holes, you need to add bit more water to the batter and start again. Drop enough Boondia / Boondi into the oil so they just cover the surface of the oil in frying pan in a single layer. Fry the Boondia / Boondi over a medium flame and remove using a slotted spoon and put them in lukewarm sugar syrup and mix well. Before making the next batch of Boondia / Boondi, clean the ladle which helps to keep the round shape of Boondia / Boondi and after each batch of frying heat oil for 1 minute to adjust the temperature. Repeat the process till you finish the batter. I made 2/3 natural colour and added red colour in 1/3 which is totally upto your choice. But remember don’t add too much colour; it gets darker after soaking into syrup. 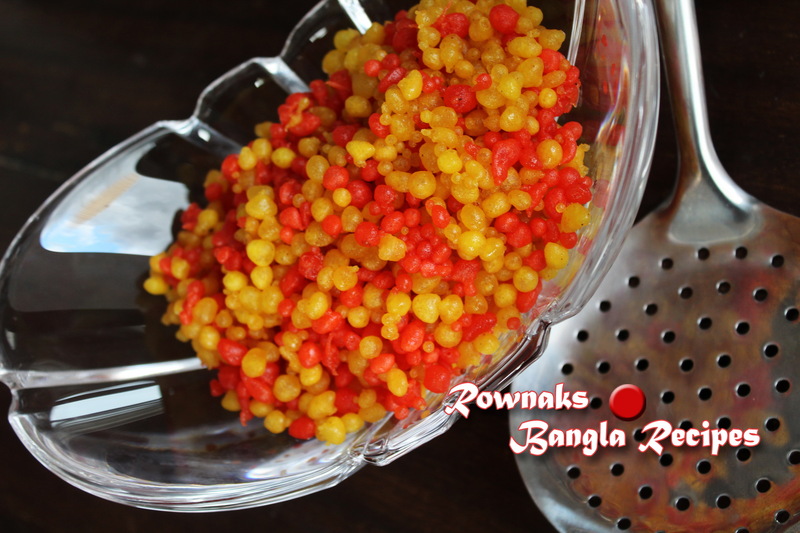 Remove soaked boondia from syrup and enjoy Sweet Boondia / Boondi / বুন্দিয়া. If the batter doesn’t make round Boondia right away through the holes, you need to add bit more water to the batter and start again. Make sure to test the oil, drop a batter in the oil, batter should rise immediately without changing colour. I made 2/3 natural colour and added red colour in 1/3 which is totally upto your choice. But remember don’t add too much colour; it gets darker after soaking into syrup. Before making the next batch of boondia, clean the ladle which helps to keep the round shape of boondia. After each batch of frying heat oil for 1 minute to adjust the temperature. We need lukewarm syrup For Boondia. Thanks for the tips Borna. I will try. Laddu kibhabe banabo janio please.